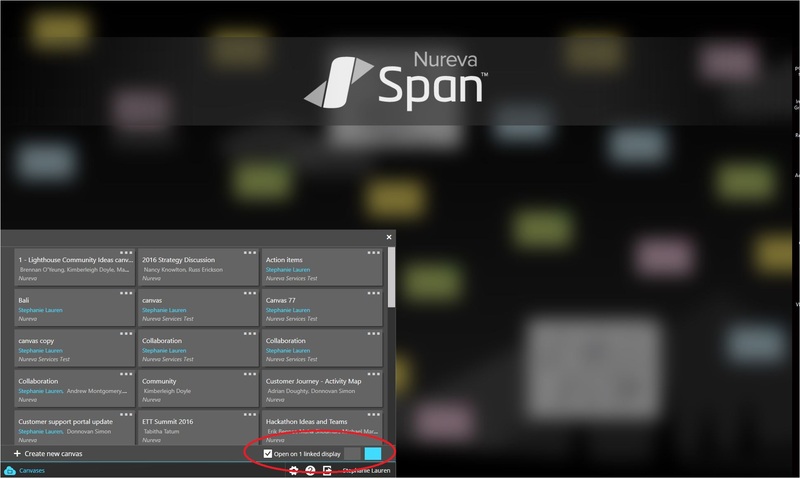 If your NUreva Wall's displays have been linked, canvases will automatically open across all of the linked displays. Follow the steps below to open a canvas across only one of your displays or to un-link your system's displays entirely. These steps are for Nureva Wall that have two or more PCs (1:1 systems). If you are working on a system with linked displays and you wish to open a canvas across only one of the displays, you can do so without saving a new display set up. Un-check the box at the bottom of the canvas list to open the canvas only on your current display. This allows you to open a different canvas on the other displays, or use the other displays for other applications. Once your displays are un-linked and the settings are saved, the software will remember those settings for all other users who log in on those displays. Tap the gear icon on the canvas menu bar and select Link displays to bring up the dialog box. Tap Update display setup before opening the software on any of the other displays. Tap OK when prompted to forget the other displays. The software will automatically apply these settings for anyone logging into these displays until a new display setup is saved.